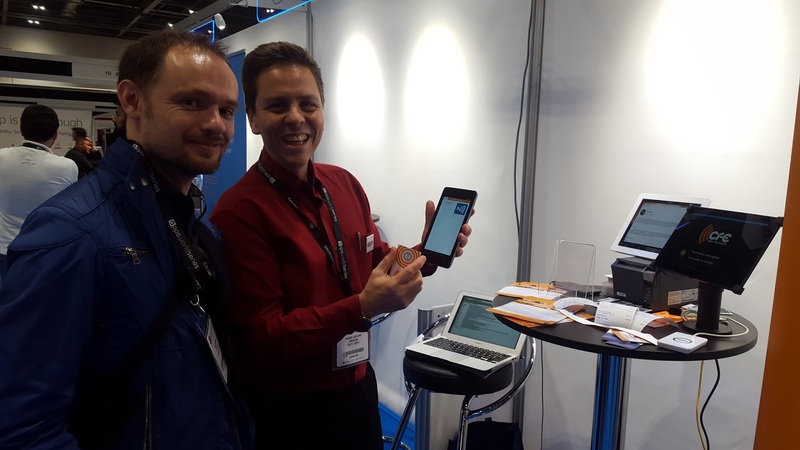 Thanks to Informa, the organisers of Apps World, we were able to offer eight free stands to the Mobile Monday London community. Thanks to all of you who came to see us, especially those who made it to the pop-up tea party, and well done to the stand winners for making the most out of the opportunity. We have some pictures and comments below. Ivo Weevers , pictured in the middle above, is from Albert - the financial buddy for self-employed on their mobile. Their premise is that current finance and accounting tools are not designed with a mobile-first mindset at all - they are scary and incredibly hard-to-use. As result, millions of freelancers are still dealing with excel files, bags of receipts, and often are not on top of their finances. Albert solves this by making finances on a mobile extremely simple and accessible to everyone. It helps with invoicing, expenses and payments. His team are the people who also created the mobile apps for Natwest, RBS and the BBC Sports, and they are in the Wayra accelerator. Here is what he said about it: "...It was a great event for us: We made valuable connections for future events, with potential partners from the industry and some people trialling our app and it was great to meet the other startups too..."
Trevor Loveland, (right above), was delighted to show off his new ‘Cash-Free Events’ system. He said "...interest was higher than I ever expected and we got some really good leads that we are following up on. We made contact with some potential collaborators and I found out that I’m able to make a big claim for ‘R&D Tax credits’ for all the work we’ve been doing!..." 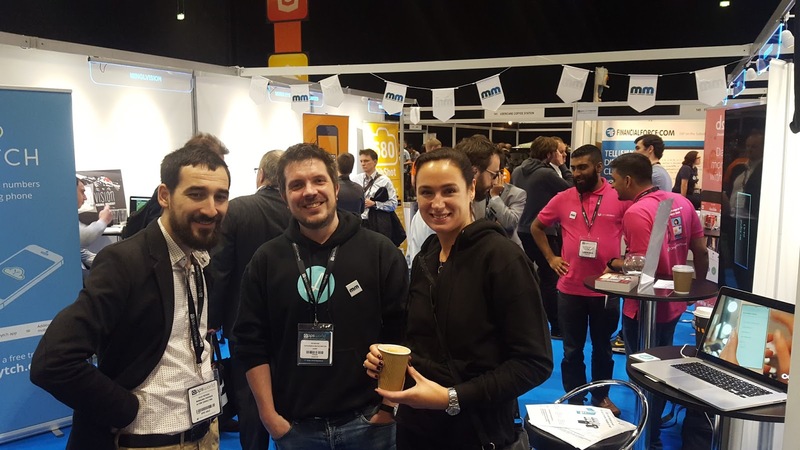 "...We were swept off our feet from moment the doors opened at Apps World. 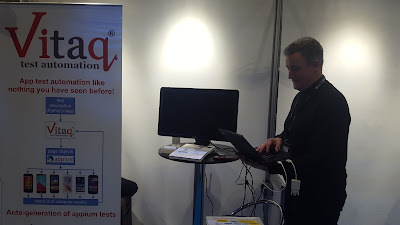 We demonstrated Vitaq connected with Appium to automatically test the Amazon App on a android mobile phone to over 50 groups of App developers. With our formal techniques based test description, Vitaq acts like a intelligent virtual user. It does everything to the App that a user would, accept that it never gets tired. Vitaq runs twenty four seven creating new test inputs pushing the App through its paces functionally testing and checking. It also monitors, measures and analyses the test coverage against defined use case scenarios. Using this highly automated approach, it is easy to compare the results of your app running on all popular devices. We were delighted with the quality of the attendees. The buzz about our App test automation rippled through Apps world. 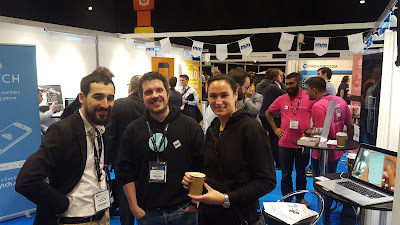 The Gartner test automation analyst came to see us, having heard from others about this new highly automated approach to testing Apps. We had App developers from big companies like American Express, Marks & Spencer and Travelex. We had many indie developers drop by. We even had security experts who were looking for new ways to do vulnerability (PEN) testing of Apps, which Vitaq is very capable of doing. We learnt an enormous amount in the two days and are now ready to exploit this fabulous opportunity..."